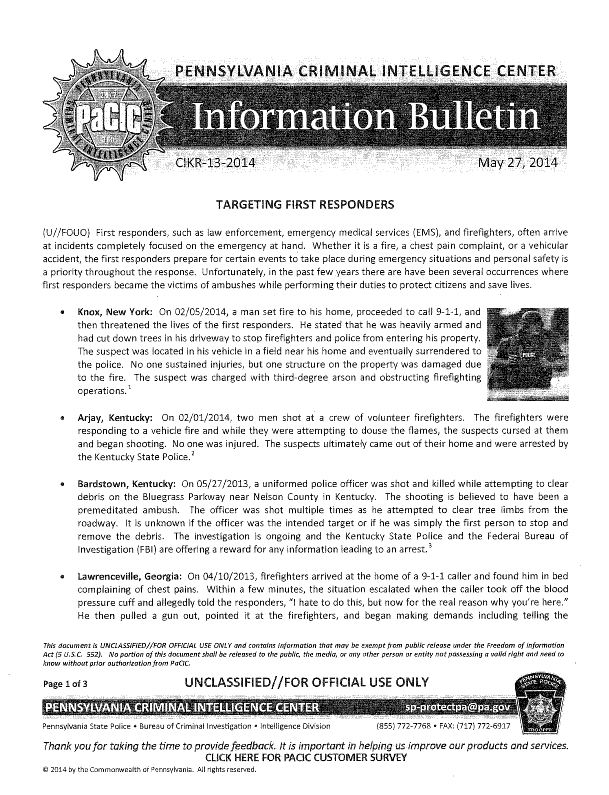 The following bulletin was obtained from the website of VFIS, an insurance company for fire departments. The bulletin is similar to another published by the New York State Intelligence Center on June 12, 2014 warning of attacks targeting law enforcement. (U//FOUO) First responders, such as law enforcement, emergency medical services (EMS), and firefighters, often arrive at incidents completely focused on the emergency at hand. Whether it is a fire, a chest pain complaint, or a vehicular accident, the first responders prepare for certain events to take place during emergency situations and personal safety is a priority throughout the response. Unfortunately, in the past few years there are have been several occurrences where first responders became the victims of ambushes while performing their duties to protect citizens and save lives. Knox, New York: On 02/05/2014, a man set fire to his home, proceeded to call 9-1-1, and then threatened the lives of the first responders. He stated that he was heavily armed and had cut down trees in his driveway to stop firefighters and police from entering his property. The suspect was located in his vehicle in a field near his home and eventually surrendered to the police. No one sustained injuries, but one structure on the property was damaged due to the fire. The suspect was charged with third-degree arson and obstructing firefighting operations. Arjay, Kentucky: On 02/01/2014, two men shot at a crew of volunteer firefighters. The firefighters were responding to a vehicle fire and while they were attempting to douse the flames, the suspects cursed at them and began shooting. No one was injured. The suspects ultimately came out of their home and were arrested by the Kentucky State Police. Bardstown, Kentucky: On 05/27/2013, a uniformed police officer was shot and killed while attempting to clear debris on the Bluegrass Parkway near Nelson County in Kentucky. The shooting is believed to have been a premeditated ambush. The officer was shot multiple times as he attempted to clear tree limbs from the roadway. It is unknown if the officer was the intended target or if he was simply the first person to stop and remove the debris. The investigation is ongoing and the Kentucky State Police and the Federal Bureau of Investigation (FBI) are offering a reward for any information leading to an arrest. Lawrenceville, Georgia: On 04/10/2013, firefighters arrived at the home of a 9-1-1 caller and found him in bed complaining of chest pains. Within a few minutes, the situation escalated when the caller took off the blood pressure cuff and allegedly told the responders, “I hate to do this, but now for the real reason why you’re here.” He then pulled a gun out, pointed it at the firefighters, and began making demands including telling the responders to move the fire truck and ambulance away, and to board up the doors and windows so police could not fire at him. Other demands made by the caller included restoring the power to his home, getting a cellular phone hooked up, and having his cable turned back on because it had been turned off as the result of unpaid bills. The suspect informed the firefighters he had been planning the hostage situation for weeks and targeted firefighters because he knew they were not armed. During the encounter, one of the hostages was allowed to go make coffee and it provided him with an opportunity to see the layout of the house and send the information to responders outside. After a few hours, law enforcement believed the firefighters’ lives were in immediate danger and a SWAT team entered the home and killed the suspect during an exchange of gunfire. No hostages or law enforcement officers were seriously injured in the incident. (U//FOUO) First responders might also be the target of terrorist attacks; secondary improvised explosive devices (IEDs) are being used overseas and in the United States. In 2012, federal authorities prevented a homeland terrorism plot Tampa, Florida. A U.S. citizen planned on detonating a vehicle-borne lED in order to bring first responders to the area. The suspect intended to detonate a second lED, hoping to kill himself and emergency personnel Secondary attacks may be more harmful and dangerous than the primary attack. Often, the second lED is extremely powerful containing more explosives. (U//FOUO) First responders form the nation;s first line of defense. Their core functions are vital to our nation’s security, public health and safety, and economic vitality. They are often in unstable conditions and the very nature of their job places them in a continual state of vulnerability. Whether the incident is a combative medical patient, a raging fire, or an armed criminal, first responders must be prepared. (U//FOUO) Recognizing the indicators for an ambush attack can be a difficult challenge. The best way to ensure an effective response to an ambush is to create a personal safety plan and train accordingly. Emergency personnel need to be cognizant that on every call they could be a target. Not only must they be prepared to help others, but they need to be ready to protect themselves. (U//FOUO) First responders must also be aware that regardless of social norms and disastrous conditions, they cannot blindly assume that residents, owners, and other individuals desire services in emergency situations. Emergency responders should be cautious not only to the dangers of the physical environment, but also when dealing with unknown individuals at the scene.